For fans of Katherine Rundell's Rooftoppers comes a story about mothers and daughters and magical trees. All Molly wants is to be normal like her friend Ellen Palmer. Ellen, with her neat braids and a tidy house and a mother and father who are home for dinner every night. But Molly's mom spends her mornings tramping through the woods, looking for ingredients for her potions. Their house is not neat, and their rooster, the Gentleman, runs wild in their yard. And it is the Gentleman that angers their grumpy neighbors, the Grimshaws. So Molly's mom makes a potion that will grow a tree between their houses. When Molly's mom accidentally drinks the potion and turns into the tree, Molly is determined to get her back. But with the Grimshaws planning to cut down the tree branches that reach onto their property, time is of the essence. With the help of her mysterious classmate Pim Wilder, Molly sets out to save her mother and discovers the wonder that lies in the ordinary. 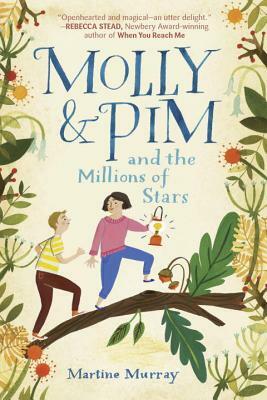 Molly and Pim and the Millions of Stars is a novel by Australian author and illustrator, Martine Murray. Molly lives in a house with her mama, Claudine the cat and Maudie the black-and-white collie dog. They live next to Ernest and Prudence Grimshaw, staunch, zipped-up, sneering people who are always complaining. Their latest gripe is about being woken by the early-morning crowing of mama and Milly’s rooster, the Gentleman. Molly loves her mama, but she wishes she were a bit more normal, like her best friend, Ellen’s mama, who lives in a normal house, drives a normal car and puts apricot muesli bars in Ellen’s lunchbox. Molly’s mama collects wild herbs at dawn, rides a yellow bike with two seats and tries to solve the problem of the complainers in an original way. But something goes a bit wrong, and suddenly, Molly’s mama is a tree. The mama tree is beautiful and different (just like Molly’s mama), with strange and delicious fruit, but it doesn’t cook. And while eating as many chocolate cashew balls as she wants for dinner is nice, Molly longs for mama’s black-eyed pea autumn stew.